Today I am an American in Paris, the city of light, Hemingway’s moveable feast. My wife, Jialin, and I arrived a couple of days early in France for a week-long barge tour in Burgundy and we will use our extra days to explore a bit more of Paris. This is our third time here. On our last visit I lost a rental car. Well, that’s not exactly what happened as it turned out. I had simply returned it to the wrong underground parking garage and Avis was still charging for the rental. A fact I discovered a couple of weeks later when my credit card statement came in the mail with a charge over $2500 from Avis. Fortunately I had been using the car on a photography assignment in southern France and the tour company client had a close business relationship with Avis and straightened it all out. The car was found and the ongoing billing ended. Some men remember Paris for a lost love, I remember it for a lost car. 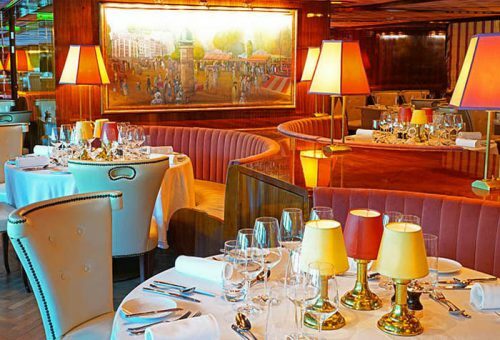 Dining Room in Uniworld’s S.S. Joie de Vivre super river cruise ship docked in Paris on the River Seine. There is more than one dock on the Seine in Paris for river cruise ships. I’ll be checking them out to photograph some of them for my upcoming book Cruising the World. 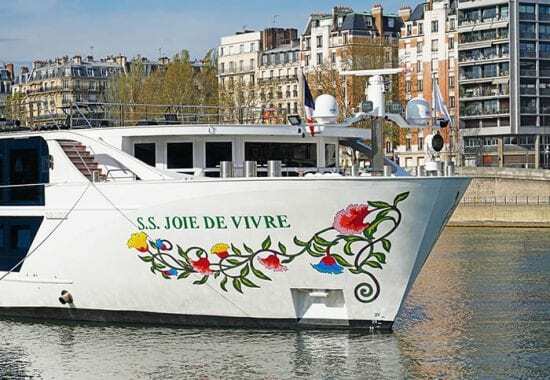 One that is docked in Paris today is owned by Uniworld, the “chic and sophisticated super ship, named for the characteristic French “joy of living.” The does one week cruises from Paris to Normandy, a short distance of only about one hundred miles, but one with numerous points of historical and cultural interest along the way. 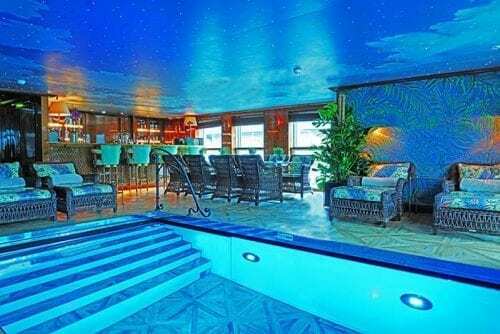 The ship itself is one of Uniworld’s newest, launched in 2017 and christened by the ship’s “godmother” novelist Joan Collins. It carries 129 passengers in high end boutique hotel ambiance. Uniworld’s ships all differ in style and have one of highest staff to guest ratios providing a high quality of service. Included is classic European cuisine and all drinks from fine wines to destination-inspired cocktails, a Parisian style bistro, a swimming pool that converts to a dance floor, Wi-Fi, gratuities, 24-hour room service, and airport transfers. Swimming pool and dance room in Uniworld’s S.S. Joie de Vivre super river cruise ship docked in Paris on the River Seine. Most of the other major river cruise lines also do this routing with similar itineraries. Attractions included in the Uniworld cruise, at no extra expense, are expert guided visits to La-Roche-Guyon – Vernon Giverny, home of Claude Monet and location of his museum that is a big attraction there; Rouen, where Joan of Arc met her end and many Allied soldiers perished in World War II; the former commune of Cauldebec-en-Caux; and the 12th Century Notre Dame, and the Palace of Versailles.